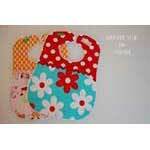 Baby bibs are easy and fun to make. 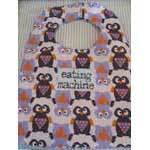 You can make bibs in so many cute fabrics and lots of different styles. 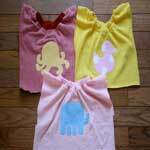 Make darling seasonal bibs for Halloween and Christmas and of course, Valentine's Day. 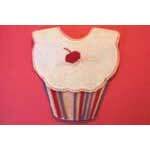 You can machine applique them if you are talented, or just make a simple bib in the holiday fabrics. 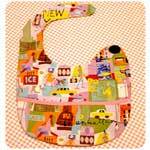 Your baby will be stylin' in new bibs you made with these free baby bib patterns. 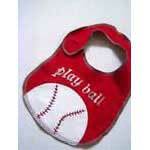 This is a great idea for a baby bib. 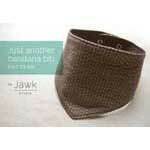 It's made from a hand or finger towel, making it easy to wash. This is a really nice bib that snaps. These would be cute in all kinds of different fabrics. 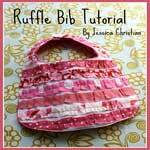 Make ruffles out of fabric strips for a sweet little bib that your little princess will love wearing when dining. 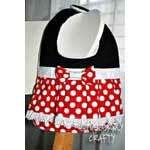 Follow these detailed instructions to create a precious Mickey or Minnie mouse bib that will look adorable on any baby. 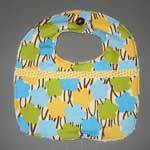 Create this precious little baby bib with cordinating prints and colors plus a little rick rack for a baby boy or girl. This is an adorable bib perfect for the Halloween season with a ghost and pumpkins on it. Here are instructions and printable templates to help you make a bib for the newborn plus six months and up. 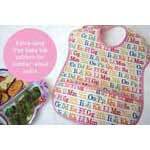 Basic instructions to sew your own baby bib. Simple directions that are easy to follow. If you can cut out a triangle then you can certainly sew this cute bandana bib for baby; it's so easy you may want to make more than one. This laminated one can be easily wiped off with a damp cloth and used again. 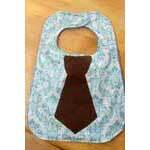 Prepare your baby for the business world by making a baby bib with a tie applique. 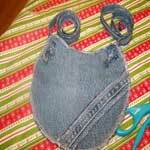 Create a inexpensive bib using leftover scraps of fabric. 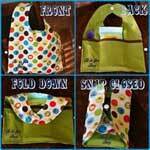 Cover baby up with a baby apron that ties around the neck and around the waist for maximum protection. 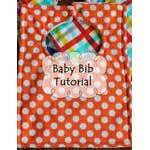 Easy bib pattern with pictures that illustrate each step. Great guide for the beginner. Toddlers like to feed themselves and in doing so can get food all over their clothes. Make a bib to keep your toddler clean. 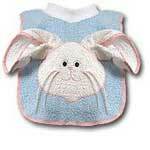 An adorable bunny rabbit with ears created using a washcloth makes this one of a kind. Baby bib pattern for a sweet little bib with a retro looking flower. Great for a little girl or change it up for a boy. The bottom of this folds up and snaps to catch food before it hits the floor. 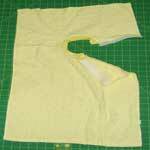 Make a bib using the collar of an old t-shirt and these easy to follow directions. With some felt fabrics and a pair of sharp sissors you are on your way to making this precious little cupcake bib for baby. 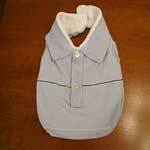 Take a boy’s shirt and make a really cool looking bib that will have baby looking preppy. 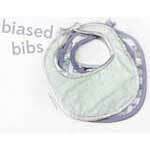 Go green by recycling old blue jeans or use the whole pair for several baby bibs. 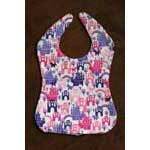 Babies and little toddlers can be awfully messy so here is a baby bib with built in sleeves to help keep them as clean as possible. Vintage dish towels have some cool colors and designs. 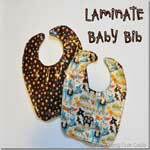 Here are simple instructions on making baby bibs using vintage dish towels. When babies teeth they drool a lot which can make their clothes soaking wet. 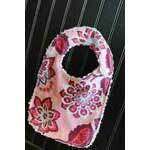 A drool bib keeps baby dry and cuts down on laundry. 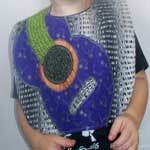 Give your little rockstar a rocking guitar bib. Here are instructions for sewing and also the applique of a guitar. 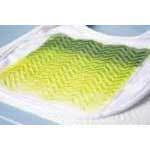 Make this dribble bib using knit fabric scraps or a re-purposed t-shirt; it's so easy to sew one you may want to make several. 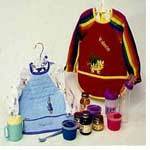 Keep your toddler neat and clean with an extra long bib made using an old baby bib as a template. 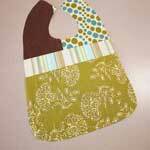 This is a fun and simple project that uses deco paint to add color and design to a plain baby bib. 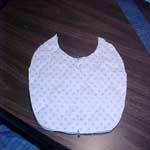 A beginner or seasoned seamstress will find this an easy to sew layered baby bib that has a single snap at the neck. 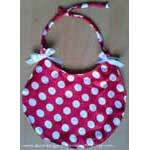 This sweet little heart-shaped bib with attached matching ribbon is perfect for Valentine's Day or anytime. 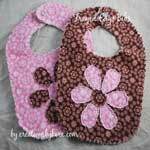 Make an attractive bib that is highly absorbent therefore perfect for drooling babies. 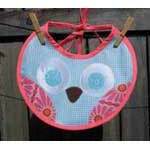 Here is a slideshow that will show how to easily make this cute little owl bib with just a few supplies. 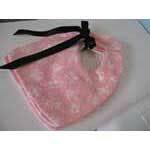 Create a one or three ruffled bib for the new baby girl in your family or to give as a gift at a baby shower. 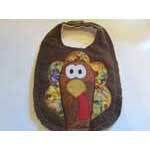 Have fun turning a brown towel into a Thanksgiving baby bib using this pattern with pictures. 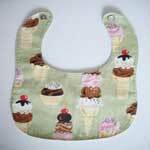 All you need for this baby bib is a piece of cotton fabric and some backing that is simply sewn together using zigzag stitching. 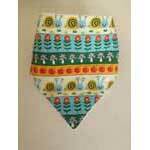 A bandana bib is easy to make and the perfect bib for a baby boy to wear. 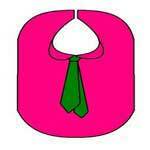 Use this simple pattern and sew one today. Follow these 13 steps to create this cool tie bib that baby can wear to the office or just sitting in the high chair eating breakfast. Gather up your scrap fabric and an existing baby bib to make this sweet and feminine bib that will look precious on your baby girl. Keep feeding items handy when traveling with a bib that has pockets to place face wipes and a spoon then fold and pack away until needed. This sweet little chenille bib with a ruffle down the center is perfect for drooling babies and helps keep you and baby dry. 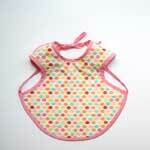 Whip-up a baby bib in a small amount of time using this super simple pattern with photos. This charming baby bib is simple to create and adding a patch makes it even more unique and personal; great as a baby shower gift. 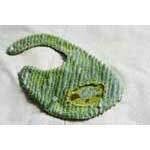 This easy to follow pattern takes an old towel and turns it into an absorbent burp bib for baby and you. 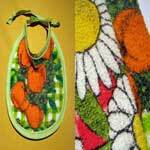 With one hand towel, some ribbed knit fabric, a cereal bowl and this pattern you can make one or several terry cloth bibs. This simple bib pattern uses a dinner plate plus a smaller plate to trace out the bib shape on fabric then with a little sewing you're done. 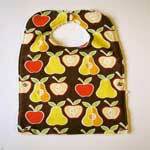 Make one or several baby bibs with prints and patterns that reflect you and your baby's own personality and style.